MALE (Reuters): Maldives Police asked the Prosecutor General on Thursday to charge former President Abdulla Yameen for providing false information during a probe over his alleged involvement in a deal to lease tropical islands. Pro-China Yameen lost a Presidential election in September and the new Government of his successor, Ibrahim Mohamed Solih, has drawn the country closer to India, probing several infrastructure deals awarded to the Chinese.The investigation relates to a deal to lease tropical islands for hotel development, and an alleged payment of $ 1 million of Government money through a private company, SOF Private Ltd., into Yameen’s personal bank account. Through a spokesman, Yameen denied any wrongdoing. The State-run Anti-Corruption Commission (ACC) in 2016 found that SOF, a company launched by former Tourism Minister Ahmed Adeeb, was used to launder over $ 92 million from the Maldives Marketing and Public Relations Corporation, the country’s tourism board. A spokesman for Yameen said the former President “does not believe that any funds of the State-owned by Maldives Marketing and Public Relations Corporation were deposited into an account owned by Abdulla Yameen”. Officials from SOF were not immediately available for comment. Yameen’s Government suspended the license of SOF Ltd. in 2017 after Adeeb was jailed on terrorism charges. The ACC, which under Yameen’s Government, initially investigated the money transfer to the former leader’s personal account, had asked Yameen to return the money in 2018. Yameen later said he had already returned the money. Police said in December the authorities had frozen the bank accounts of Yameen with Maldivian Rufiyaa 100 million ($ 6.49 million) in both US dollars and the local currency. 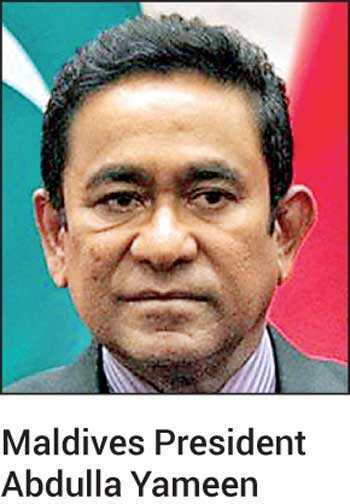 During Yameen’s tenure from 2013-2018, critics alleged that contracts, including a major bridge and an extension to the international airport, were given to Chinese companies at inflated prices.